A dog can think past his nose when there’s a dish of food ten feet away and nothing between him and it. Beyond that, forget it. He knows his immediate need and he feeds it. But to be human: future-gazing seems to be our destiny and our curse. We look to the days (and years) ahead and think, “Once I have this, or do that, or have lots of money, or…or…or.” We convince ourselves that only something in the future can appease our hunger today. But tomorrow never comes until after today is over. And today is all the time that we have to affect who we are and what we do. “Eat now,” for tomorrow we’ll be hungry again. I have all of these thoughts swirling through my head about what I would still like to do with whatever time I have…and I do nothing. I’m thinking about things I need to do tomorrow when I’ve already set the plan in motion. How many times and in how many ways can I tweak what is ready? I think about all the things that could go wrong before I’ve even lived them. And then I realize that “today” I was fine, and worries from yesterday never happened. But I ignore the satisfaction and joy from that…because I’m already distracted by tomorrow. So as I write, as I think about supper today, as I pet the dog, I must trust in what I have set in motion for tomorrow and enjoy these simple things of today. If the future is not enough we also overwhelm ourselves with memories, past regrets, things we didn’t do, and folks who have wronged us (revenge takes up so much of our thoughts and time). I’m sure we’ve all heard that we get hard-wired into who we’ll be by the time we’re five (or so). In other words, we look back and blame our upbringing, our parents, our teachers, anyone who had a hand in developing who we are. I say: let it go. Get over it. As adults, we’re now in charge of ourselves and the decisions are ours to make. And not just the decisions but the consequences as well. But…we just can’t let those slights and injustices go…so we mull, we ponder, we come up with excuses…and another day passes. How does reliving the past help us live today? Sure, there’s lessons to be learned so learn them – and move on from yesterday and into today. Today is where it’s at! And this moment is where you are? Don’t pretend that those things that came before are the only things you have today. 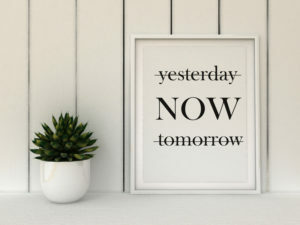 At this moment – right now – what can you do that you know you can and should do? It doesn’t have to be a big, life-changing event that you think needs to happen before you can be who you know you truly are. It can be in the smallest of things – go for a walk, do the dishes, and one that I’m a particularly a big fan of — write in your journal. In the themes of our journals are the themes of our lives. For myself, I have always considered myself a writer and yet have done far too little to advance that goal. But that hasn’t stopped me from dabbling in ideas. I have half a dozen story outlines, plays, and even some “lofty” poems that I would like to work on, but I’m my own worst enemy when it comes to picking one and staying with it. Why? Will it be a money-maker? Does it represent my values, what I hold dear? Who am I to think others would read what I write? All of these questions…and here I sit, pretending not to know the answer. Can you see both my future fears and past hang-ups in the list above? They’re there, and it’s for me to figure out my way through these fears as I learn to move forward. I think we second-guess ourselves and get frozen in the “what-ifs” and “I’m-not-good-enough.” What we should do is pick that one thing, that one project, that one self-discovery we want to make and, well, you guessed it – just do it! We create our obstacles when we think or talk too much about what we want to do. Decide what you want to do, right now, and live by that – ruthlessly! And I can start – in this moment.